The President has led our country toward a diminished role in the world the last few years and public sentiment has followed. In spite of that, our world continues to get ever smaller. We can ignore the interlocking aspect of the world today as it continues to shrink each day as travel, trade, business and geopolitical affairs affect all of us. My wife and I took our annual trip this year to South America. We have been there before, but we left feeling we do not go there enough. Many Americans travel east to Europe or west to Asia but neglect our neighbors to the south. We went to three countries on this trip: Peru, Ecuador and Colombia. We found three countries that have wonderfully nice, warm people who actually like Americans. As a bonus all three are on American electrical current so no need for those cumbersome converters and adapters. In addition, Ecuador uses American money as its currency. It is one of the 11 in the world that do other than the U.S. What a joy not to have to do all those conversions. One more joy: no jet lag. The largest time change is for west coasters, as these countries vary between Central Time and Eastern Time as the South Americans do not use daylight savings. Peru was our first stop and it showed there is still some third world aspect to this area. Upon seeing some of these areas you wonder what people in America are talking about when they speak of poverty. Poverty is almost nonexistent in America compared to other countries in the world. Lima is a huge city of close to nine million people that has the contrast of many indigenous people still living in olden times and a sophisticated modern society with one of the hottest food scenes in the world. It was our initial experience of images of Incas, akin to what we all were exposed to in grade school. No trip to Peru would be complete without going to Cusco which is the jumping off point to Machu Picchu. Because of the growth of tourism and mining in the area, Cusco has become a thriving city of a half million. 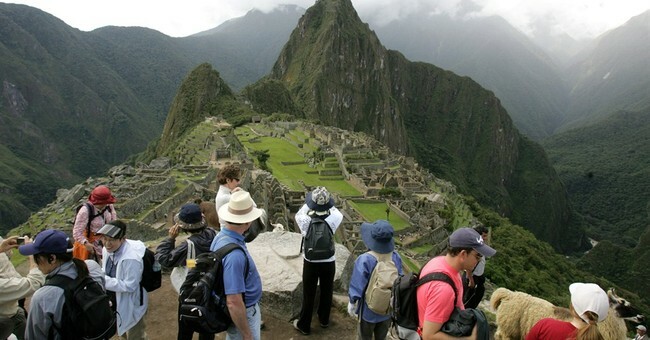 Machu Picchu deserves the recognition it has received as one of the seven wonders of the modern world. It takes your breath way, and not just because of the altitude. You are left wondering how the Incas built such structures at what seems like the top of the world. Developers today would kill for views like this. If we had ended our trip here it would have been magnificent. But our trip became ever more exciting. Upon arriving in Ecuador I sent an email to a friend of mine who had relocated there stating “Great country – American currency and American current.” But before we went to see him, we had to follow the path of Darwin by touring the Galapagos. These islands are 600 miles off shore but still part of Ecuador. The Galapagos is a magical place of Blue-footed Boobys and giant tortoises, not to mention endless sea lions frolicking on the shore lines. This is a nature lover’s dreamland with outstanding snorkeling included. When we arrived in Cotacochi, which is two hours north of Quito, we met up with my friend and we soon found out why 500 Americans were living in this town and an estimated 15,000 ex-pats were in Quito. We received the grand tour showing us the wonderfully affordable residences. The lifestyle comes with workers that earn an Ecuadorian minimum wage of about $350 per month. And then there is the unbelievable weather. If you told someone you would be at the Equator and not drenched in sweat, they would probably look at you crossed-eyed. But because of the elevation both Cotacochi and Quito have near perfect weather with no humidity, and only two seasons – rainy and dry. This weather makes the area amazingly green and fertile. The locals have all the comforts most expect of home including, high–speed internet, satellite TV with all the channels, Amazon and even Netflix. We asked about medical care, but how could we argue with their care while leaders in America are trying to make ours less accessible. It seemed quite attractive as a place for retirement on a limited budget. Our friend set us up with his friend to show us around Quito. This man was kind of a mutt. Born in England of Polish heritage, he travelled the world and has been in Ecuador for 21 years. I asked him when it was that they converted to using American currency. He said it was in 2000, and that it has been night and day since creating economic stability. Maybe Argentina should consider converting to American currency to end their constant banana republic inflation. Interesting because Ecuador must buy their currency from the U.S. Mint they only have coin dollars – no paper dollar bills. The U.S. is the only country remaining using paper dollar bills. In that way we are still spoiled. Ecuador is the land of roses. They ship hundreds of thousands of roses daily. Beautiful roses are everywhere by the dozens and inexpensive. And the roses grow straighter than anywhere else because of being at the equator and the forces of gravity. Also, once you step on land in Ecuador you are an average 4.5 pounds lighter -- another benefit of being at the Equator. Colombia has scared away many people because of the drug wars. In fact, many Colombians relocated to the U.S., where there is apparently actually a larger community of Colombians in Miami than Cubans. Who knew? But they are moving back to Colombia as the country has stabilized over the last ten years. No more drug wars and a booming economy. After relaxing in Cartagena -- a wonderful beach city built in an old walled city (a modern city surrounds) -- we went to Bogota which we found to be the most sophisticated and thriving of the three capitals (after Lima and Quito). Many Colombians we met had moved back from the U.S. and the culture and food scene is world class. One friend we met in Bogota told us that the level of security needs was reduced 99% from ten years ago. He had moved his family back from Miami. And many Colombians told us they love Americans in their country. There is also a growing ex-pat community in Bogota and American business people are everywhere. Our President has only made one trip to South America, not including going to Cartagena for a Summit of the Americas. Clinton and Bush were there much more frequently though not one of them went to Ecuador which has adopted our currency. Instead of pivoting our foreign policy to focus on Asia, we should spend more time in our backyard. South Americans are lovely people who for the most part like Americans and have a wonderful continent to explore. You should give it a whirl. We cannot wait to go back.